Mocean Equipment Identity Register (EIR) provides Mobile Operators a mechanism to deter the stealing of mobile phones. When a Mobile Phone is stolen, the Mobile Subscriber can request the Mobile Operator to deactivate the stolen Mobile Phone. The Mobile Phone’s IMEI is then entered into the Mocean EIR system as a deactivated Mobile Phone. 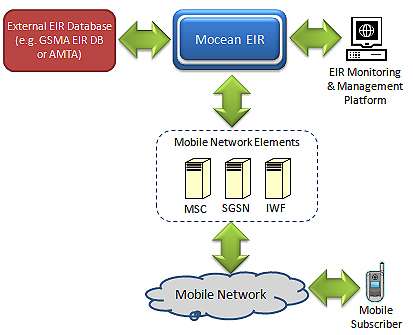 When the stolen Mobile Phone is used to access a mobile network, the Mobile Operator’s network elements will then do a check with the Mocean EIR using SS7 MAP protocol. Mocean EIR will check from its IMEI database and finds that the particular Mobile Phone has been deactivated and notify the network accordingly. The mobile service request will be rejected and the stolen Mobile Phone cannot be used. Mocean EIR can also be integrated with external IMEI Databases to implement a national or global initiative to bar the usage of the stolen Mobile Phone out of its own network. Mocean EIR provides the ready solution for Mobile Operators to play an active role in discouraging mobile phone theft.